CHEVROLET Vintage Chevrolet Car Club - $10.00 : Bob Hoyts Classic Inspection Stickers, Add a Final Touch to your Restoration! 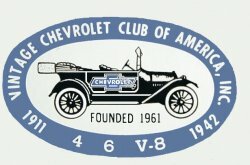 This Chevrolet Vintage car club logo dates back to 1961. It was intended for Chevrolet cars from 1911 to 1942.